"The world is my true ration Its people are my nation." Humanism is an abiding tradition in Turkish culture. Before adopting Islam and settling in Anatolia, the Turks had already acquired anthropocentric attitudes as a result of the vicissitudes they experienced in long periods of exodus and during relatively brief sojourns in Asia. Changes of locale, shifting cultural orientation, new religious allegiances, wars with many nations and communities, struggle for survival in the face of natural disasters helped to create among the Turks a sense of life's impermanence as well as faith in human endurance against the ravages of a hostile world. Contact with diverse peoples diminished their ethnocentricity and gave them a faculty for latitudinarian relations. Cataclysmic social and cultural changes instilled in them a sense of reliance on man rather than institutions. The seeds of humanism which the Turks brought with them found fertile ground in Anatolia, where Sufism (Islamic mysticism) had firmly established itself. During their conversion to Islam and assimilation of its cultural concomitants, many Turks embraced the Sufi doctrine as well as its humanist concepts which were congenial to their pre-Islamic humanistic tradition. By the late l3th century, Islamic mysticism-particularly the Sufi philosophy of Rumi-had become widespread and vastly influential in many parts of the new homeland of the Turks. After several centuries of turmoil in Anatolia-with the ravages of the Crusades, the Byzantine SelÃ§uk wars, the Mongol invasions, strife among various Anatolian states and principalities, and frequent secessionist uprisings still visible or continuing-there was a craving for peace based on an appreciation of man's inherent worth. Mysticism, which attributes God-like qualities to man, became the apostle of peace and the chief defender of man's value. While the "ghazi" (warrior, conquering hero) spirit still served as the primary impetus to Turkish conquests, the intellectual tradition of mysticism, with its central concern for man's dignity and worth, formed an antithetical, if not antagonistic, alternative to warfare and to inter-religious strife as well as intra-religious sectarianism. The Turkish mystics articulated the idea that only one acceptable struggle may be undertaken: against man's "internal enemy" which is selfishness, vanity, ambition, and faithlessness. They denounced war and discord as morally indefensible and ethically wrong. The humanistic mysticism of Anatolia in the late l3th century, with its concern for peace, brotherhood. man's intrinsic significance, and humanitarianism; was the culmination-better still, the perfection -of the incipient humanism which the Turks had brought with them from Asia. The tradition of Turkish humanism is best represented by Yunus Emre (d. ca.1320). His poetry embodies the quintessence of Turkish Anatolian-Islamic humanism, and has served as a fountainhead of the humanistic concepts which have been at work, overtly or implicitly, in the intellectual life of the Turks in later centuries. Yunus Emre was the most significant literary figure of Turkish Anatolia to assimilate the teachings of Islam and to forge a synthesis of Islam's primary values and mystic folk poetry. His verse stressed the importance of the human worth and viewed Islam not in terms of rigid formulas but in terms of freedom of the conscience and fundamental ethos. Humanism is a system of thought which exalts man in his relations with God, nature; and society. The humanist accepts man as the criterion of creation, but the dogma of many major religions, including Islam, supports the concept that man's existence on earth is devoid of significance or value. As elsewhere, mysticism and humanism in the Islamic world emerged as the dialectical antithesis to this theological interpretation and to religious formalism. Yunus Emre, the first great Turkish humanist, stood squarely against Moslem dogmatists in expressing the primary importance of his existence. What would I do with the skies. From this ground where I fix my gaze. And none so wonderful as Man. But is contained in this heart's cast. He is neither in the Holy Land nor in Mecca. When love arrives, all needs and needs are gone. Can there be anything better than love? Abandons his religion and nation. I call you out, my God. I call you out, my. I am St. George: I died a thousand times. Yunus Emre represents what AbbÃ© Bremond defines as "humanisme dÃ©vot. " A central element of his humanistic thinking is the belief that, as Montaigne formulated it several centuries later, man aspires to be divine, but comes nearest to it when he is content to be truly human. The Turkish poet goes further in asserting that only love imparts God's gifts to man. The proverbial statement of Protagoras in the 5th Century B.C. "Man is the measure of all things" often invoked as the inception of humanistic thought, has limited value for Yunus Emre who extends it into poetic passion and pantheistic vision. he became a legendary figure and a folk saint. In his lifetime, he travelled far and wide as a "dervish," not "colonizing" like many of his fellow dervishes, but serving the function of propaganda fide through his poetry. For seven centuries, his verses were memorized, recited, and celebrated in the heartland of Anatolia. His fame has become so widespread that about a dozen towns claim to have his tomb. To sing in the name of God Almighty. In the late 19th Century and in the early 20th, this same hymn used to be sung by children in Istanbul and elsewhere on their way to or back from school or just before classes started. So, in the rural as well as in the urban areas, the poetry of Yunus Emre remains a viable cultural force and a cherished aesthetic experience. It would probably be correct to describe Yunus Emre as the most important folk poet in the literature of Islam. Certainly, he is Turkey's greatest. Writing at the outset of Anatolian Turkish folk poetry, he achieved the consummation of that tradition. No folk poet of the later centuries has been able to match that achievement, although generations of mystic and folk poets took him as their principal standard of excellence. Too many words arc fit for a beast of burden. 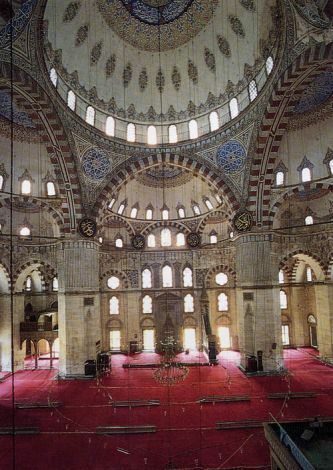 Yunus Emre practiced free use of living tradition, whereas others often produced, servile copies of antique masterpieces. He was able to use the forms (particularly the "ghazal"), the prosody (the quantitative metric system called "arud" in Arabic, "arud" in its Turkicized version), and the vocabulary of Arabic and Persian poetry. But most of his superior poems utilize the best resources of Turkish poetry, including the syllabic meters. This was in sharp contrast against the practice of the poets who belonged to the urban elite: they revelled in elegant verses composed in preponderantly Persian and Arabic vocabulary intelligible only to the highly educated. These poems later became unreadable because of obsolescent words. But Yunus Emre's adherence to Turkish vocabulary secured his continuing appeal to the Turks. Even today, in the seventh century since his death, most Turks can read and appreciate Yunus Emre without consulting a dictionary too frequently, while they find many classical poets of the 14th to the 19th centuries quite unintelligible. Love is the mission of my life. Look on and on, you can't have enough of that lass. In this sense, he was akin to Petrarch, also a l4th century poet, and to Erasmus, a century later, who, as part of their classical or Renaissance humanism, shunned the dogmatism imposed on man by scholasticism, tried to instil in the average man a rejuvenated sense of the importance of his life on earth. Similar to Dante's work, Yunus Emre's poetry symbolised the ethical patterns of mortal life while depicting the higher values of immortal being. Yunus Emre also offered to the common man "the optimism of mysticism" - the conviction that human beings, sharing Godly attributes, are capable of transcending themselves. Sufism with its theocentric humanism is pervasive in YunÃºs Emre's poetry. His theology consists of idees rÃ©Ã§ues since he was not an original thinker. He sought neither theological innovations nor philosophical contributions. He was content to utilise the available corpus of mystic thought and literature which had followed a long line of evolution with elements from Buddhist, Indian, Manichean mysticism, the NeoPlatonism of Plotinus, Christian mystic sects, the Jewish cabala, and the Moslem thinkers Mansur al-Hallaj, Ibn-Arabi, Al-Ghazali, Attar, Ahmed Yesevi, Rumi et al. The man who looks sees his own face in there. Burning, burning, I drift and tread. Come, see what love has done to me. He has devastated his selfhood, his hands are drenched in blood. Fear not, your life is eternal. The true man is he who knows this unity. You and He aren't apart-you're one. He is God Himself human arc His images. See for yourself : God is man, that is what He is. If you don't know yourself, you are worse than a beast. "God is the highest subjectivity of man abstracted from himself. The essential predicates of divinity, such as personality and love, are simply the human qualities men evaluate most highly. " Who was Yunus Emre? This man who called himself "Yunus the lover," "Yunus the dervish"? Was he a "perfect man"? What manner of man? What was the life he led? About his life we know precious little. What we do know tends to be legend rather than ascertainable fact. Internal references in his poems clarify very little in autobiographical terms; besides, some of them are misleading, some full of contradictions. They are mostly expressions of mystical views or poetic depictions of psychic vicissitudes. Yunus Emre's year of birth was probably 1241 and his year of death 1320 or 1321. The controversy on the authenticity of some of the poems attributed to Yunus Emre is fruitless. In many cases, it proves impossible. to determine that the poems belong to other specific poets. Furthermore, the verses held to be of dubious authenticity bear a striking resemblance, in content and style, to Yunus Emre's authenticated poems. We tend to accept as his all the poems attributed to him, even if this means the acknowledgment of Yunus Emre as a collective poetic entity rather than a single individual poet. Yunus Emre may be seen as the poetic embodiment of Anatolian Turkish Islamic humanism in the late l3th and early l4th centuries. Tradition and legend depict Yunus Emre as a poor peasant. At a time of famine, he goes on the road in search of seeds in return for the wild pear he picks on the Anatolian steppes. While travelling in the hope of bartering his wild pear for grains and seeds, he happens to come to the "tekke" (congregation place) of Hach Bektas, the founder of the most latitudinarian sect of Anatolian Islam. Hacy Bektas, a grand old man and a poet in his own right, asks Yunus if he would accept a "nefes" (a breath of blessing) in exchange for each handful of wild pear. Yunus refuses. Hacy Bektas increases his offer: "We shall give you ten breaths of blessing for each handful." Yunus still refuses. Thereupon, Hacy Bektas gives Yunus a sack full of grains. On his way back to his village, Yunus at first feels very happy, but then reconsiders the incident and realises its moral significance: "Hacy Bektas must be a great man," he ponders. "He is no doubt a man of noble spirit. Because a lesser person would have resented me for not accepting his blessing, and surely he would not have given me such a generous amount of grains." Realising his mistake, he rushes back and says: "Here's your sack of grains. Take it back and give me your blessing." But Hacy Bektas replies: "I can not, because we turned over your padlock to Taptuk Emre." This means, in mystic parlance, that a spiritual guide has been appointed to the initiate who is to embark on the path of the search for God's truth. Yunus starts searching his guide, Taptuk Emre, another great Anatolian mystic, who, according to legend, originally came to Anatolia in the guise of a pigeon, but was nearly killed by fanatic traditionalists who appeared as eagles refusing to give him passage. Although w and bleeding, the bird of peace got by the cruel eagles, and was rescued by a peasant woman who showed compassion, healed the wounds, and set the bird in flight again. This is how Taptuk Emre's spirit, it is said, roamed from one end of Anatolia to the other. The symbolism of the legend also establishes the spiritual link between the mystic and the peasant of the Turkish countryside. After a long and arduous search for his guide, Yunus Emre finally finds Taptuk Emre, and enters the congregation, where, for the proverbial forty years, he leads an ascetic, abstemious life. He toils, contemplates, seeks spiritual communion. One day, at a gathering of the faithful, Taptuk Emre asks a poet to say poems extemporaneously, but the poet fails. So Taptuk asks Yunus Emre to try: "What Hacy Bektas once told you is at last a reality. Your padlock is now unlocked." Up to this point, Yunus had not been known to have composed poems. But obviously his poetic gifts were in a state of efflorescence throughout his long years of mystic contemplation. He breaks into poems, and the congregation becomes ecstatic. From that day on, Yunus is recognised as a great poet. The soulful man whose poems are eloquent, moving, pithy, profound, and compassionate turns into a legend throughout the land. And came into sight as Yunus. It is also said that Rumi admitted he would not have written his huge magnum opus if he were able to make such pithy statements. Another Anatolian legend claims that Rumi once paid the following tribute to Yunus Emre's stature as a mystic: "Whenever I arrived at a new spiritual height, there I found the footsteps left by that Turkish mystic-and I could never surpass him." For a Molla Kasim will come to cross-examine you. When Molla Kasim reads this prediction, he realises the greatness of Yunus, and he immediately stops destroying the poems. It is said that the poems which have come down to us are those that escaped destruction in this way, but, in the process, two thirds of Yunus Emre's entire poetic output was presumably obliterated. In God's world there are a hundred thousand kinds of love. Yunus Emre's poetry is intensely human in its sentiments and humane in its concern for all, particularly for the plight of deprived people. He was the first-and the most successful-poet in Turkish history to create the "aesthetics of ethics." All the people of the world are brothers. Yunus Emre's view of mysticism is closely allied with the concept that all men are born of God's love and that they are therefore equal and worthy of peace on earth. Ours is not the portal of despair or misery, come. True love is born when a11 faiths are united as a whole. Even strangers are friends of mine. This mystic moral attitude has echoes from a hadith (tradition), a statement ascribed to the Prophet: "Bear no malice against one another, do not covet each other nor turn a could shoulder to your fellow men. Vassals of God, be brothers." Toil, carn, cat, and give others your wages. Their hearts arc shorn of charity. When they are certain they cannot grab it. Inflict distress and pain on the populace. Yunus Emre, despite his profound belief in the natural goodness of man, occasionally complained bitterly about the moral climate of his time: "Men of dark deeds are held in great esteem ... The novice ferociously fights his master ... Sons and mothers are locked in fierce combat. .."
True faith is in the head, not in the headgear. Better than a hundred pilgrimages. For heaven's sake, what is faith or creed without love? The heart is where God's truth rests. The true lovers of God have no craving for 'Paradise. They strive beyond Paradise to arrive at His domain. Yunus Emre directs his scathing satire at bigots who offer narrow, superficial, and formalistic interpretations of Islam. He brings some orthodox views into a sharp focus in a devastating poem. Heaven's bridge is sharper than a sword, thinner than hair. You know, I d like to go on it and build houses right there. I want to walk over to its shade and lie there a bit. May it please you, I think a little burning is a bliss. My tongue arms the ways of God, not that my heart accedes. They think I am the way I look, they think I commit no sin. Is to hurl me into Hell's crackling flame.